Leading contingency-based litigation law firm names Jabran “Jay” G. Yasso a senior shareholder and elevates Tad T. Roumayah from associate to shareholder. Sommers Schwartz P.C. 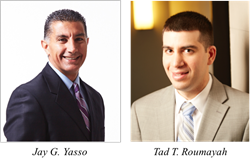 is pleased to announce that Jabran “Jay” G. Yasso has been named a senior shareholder and that Tad T. Roumayah has been elevated from associate to shareholder. For more than 20 years, Jay G. Yasso has focused his practice on medical malpractice, automobile negligence, and personal injury matters, and has litigated, mediated, and facilitated numerous multi-million dollar settlements on behalf of his clients. He also represents individuals and businesses in the entertainment industry, including record companies, artists, producers, agents, authors and songwriters, publishers, and models. Mr. Yasso is actively involved with St. Regis Parish in Bloomfield Hills, Michigan, serving on the Board of Directors of the School Finance Committee and the Capital Campaign Committee, and as a basketball coach, counselor, and mentor. He sits on the board of the D-MAN Foundation, a non-profit devoted to assisting people with disabilities, where he helped build a music therapy studio. Mr. Yasso is a member and has been actively involved with The Grammy Awards - Chicago Chapter. Tad T. Roumayah represents employees who have encountered discrimination, wrongful discharge, whistleblower retaliation, wage theft and abuse, Family Medical Leave Act and civil rights violations, and other employment issues and disputes. He also counsels people and businesses involved in contract disputes and business torts, and advises companies on their human resource policies, procedures, and other employment-related matters. Mr. Roumayah has been named to the list of Super Lawyers Rising Stars in Michigan annually since 2013, and in 2014, was recognized by the U.S District Court for the Eastern District of Michigan for his pro bono service and contributions. Additionally, senior shareholders Matthew D. Curtis, Richard D. Fox, Kevin J. Stoops, Daniel D. Swanson, and Jason J. Thompson have each been re-elected to one-year terms on Sommers Schwartz’s board of directors. Messrs. Curtis and Fox practice in the areas of medical malpractice, birth injury, and personal injury; Messrs. Stoops and Swanson represents clients in employment and commercial litigation matters; and Mr. Thompson focuses his practice on mass torts, complex litigation, and class actions.